Wow... things are getting bit busy around here at the minute. I'm busy making jewellery for the Bang Bang Vintage shop in Sheffield as items have been selling well, as well as working and preparing for our holiday which is just two weeks away now! I've added a couple of necklaces for sale this weekend too. I sent both of these to the shop and they sold so I thought it was only fair to include them for sale on the web too so I made some more! 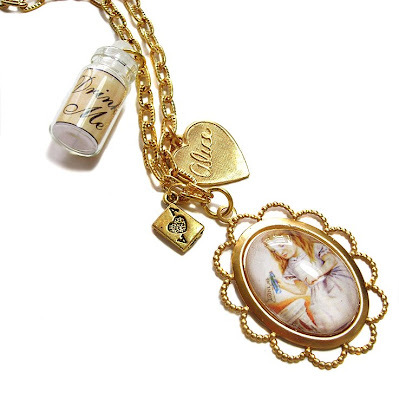 This necklace features a beautiful Alice in wonderland pendant, a glass drink me bottle and a cute Alice charm. One of my favourites! I keep promising myself I will make one for me! 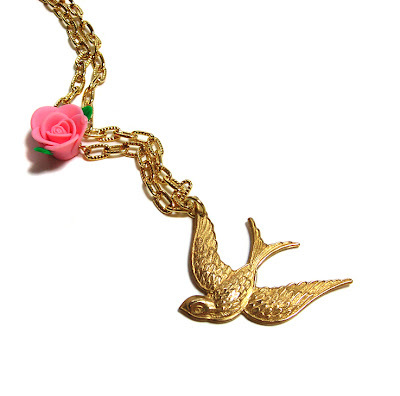 A simple swallow charm hangs from gold tone chain with an adorable pink polymer clay flower for company. Hi Janine, I love your Alice necklace it looks so classy and vintage at the same time. The Swallow is gorgeous too.